You can feel it. Your skin is unusually dry, your sinuses are parched and you get a static shock every time you reach for a door knob. Because humidity is so low during the winter, what little moisture is available quickly evaporates into the air. From static shock to scaly skin, dry winter air can be a big nuisance. Follow these tips to increase humidity in your home and make it through winter comfortably. Reduce the risk of infection. Moist air keeps your sinuses lubricated, helping to stave off illness. Prevent dry skin. Dry air saps moisture from your skin, but a humidifier can fend off that uncomfortable dry skin feeling. Promote healing. If you do wind up with a cold, sinus infection or the flu this winter, a humidifier can help you heal faster and reduce symptoms like sneezing and coughing. Protect your home and furnishings. Dry winter air can mean big trouble for your home, especially anything that’s made of wood (doors, molding, wood furniture, etc.). A humidifier can lengthen the lifespan of wood furnishings. Water your houseplants. Dry air can be the death of household greenery. Moist air helps your plants not only survive but thrive. Reduce static shocks. Humidified air prevents a startling shock every time you turn a doorknob or pet your dog. Lower your heating bill. Moist air feels warmer than dry air, which could make you less likely to turn up the heat and help save on energy costs. Improve your sleep. Maintaining humidity in your bedroom can create a more comfortable sleeping environment, and it can also prevent snoring by lubricating your sinuses and throat. Use distilled or demineralized water to prevent buildup and bacterial growth. 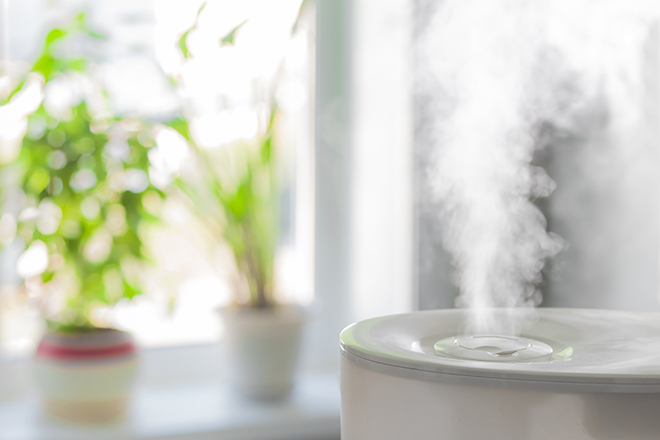 Clean the humidifier once a week, so you aren’t allowing germs to circulate. Change filters regularly. If your humidifier has a filter, change it according to the manufacturer’s instructions. Maintain a humidity level between 30% and 50%. Anything above that can cause mold growth, dust mites and respiratory issues. You don’t need a manufactured humidifier to add moisture to dry winter air. Make a DIY humidifier by placing a damp hand towel over a heat vent to let warm water evaporate. You could also boil a kettle or open pot of water on your stove. For safety, make sure you’re in the room if you choose this method. Other simple ways to raise the humidity include showering with the bathroom door open to let out steam. If you take a bath, don’t drain the tub right away and allow the water to evaporate. Let laundry air dry on a drying rack set up in your living room or bedroom. Skip your dishwasher’s heat dry cycle and allow your dishes to air dry and humidify. Even setting out bowls of water throughout your home or atop radiators if you have steam heat can help put more moisture in the air. The cold air that enters your home through cracks and crevices has low humidity. Crank up the heat all you want, but making it warmer inside your house won’t increase the amount of moisture in the air. While it’s impossible to prevent every molecule of cold, dry air from seeping into your home, you can make a significant difference by making sure your home is well insulated. Seal leaks in windows, doors, attics and crawl spaces with weather stripping, spray foam or caulk. Such DIYs are best done as a part of your fall home maintenance routine, but better late than never! Beefing up your home’s insulation will keep you warm and cozy, and it could also save you money on your heating bill. Be more mindful of the amount of water you consume on a daily basis. Staying hydrated throughout the day will moisturize your whole body. Now is also a good time to revamp your winter skincare routine. Dry skin is unsightly and uncomfortable, so keep moisturizer and lip balm handy. Slather on lotion immediately after you shower to lock in moisture. If you’re heading outside, you can also hydrate nasal passages with saline drops or by applying a little petroleum jelly inside your nostrils with a cotton swab. As heavenly as a steaming hot shower may feel on a frigid winter morning, those scalding temps can seriously dry out your skin. Hot water strips the skin of the natural layer of oil that helps it retain moisture. Instead, try lowering the temperature to warm, and try not to linger in the shower. It dries out your hair and skin and runs up your water bill. Maintaining an appropriate level of humidity in your home is as essential for your health as it is for your home’s health. Incorporate these tips to keep your family healthy this winter, and make sure your home is healthy too by talking to a Homegrown Pro in your community. Call 1-800-499-3612 to review your policy and coverage options.